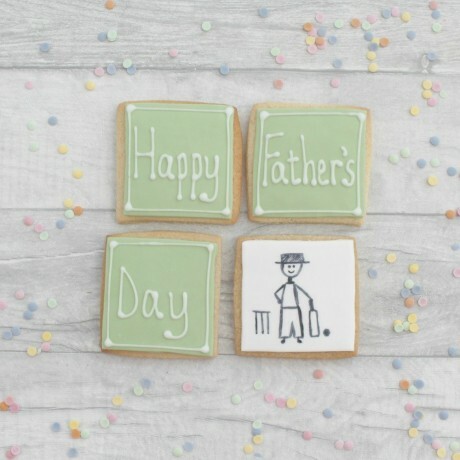 A delicious gift to show your cricketer Dad how much you love him this Father's Day! This listing is for 4 3" square cookies as shown in green sugarpaste with piped white royal icing, and painted sugarpaste details. 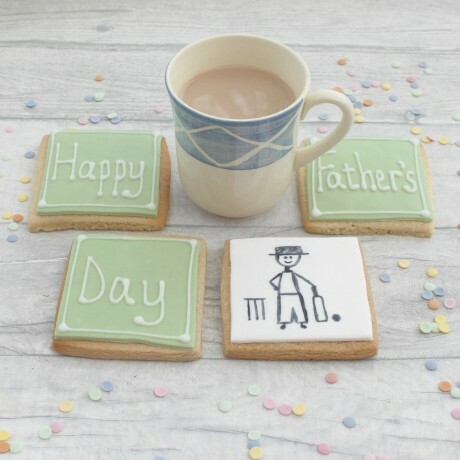 Other flavours of biscuit, and colours of decoration are available, choose using the options. I hand make my coloured paste, so colours my vary slightly, and screen colours may also change the colour of the original product. Handmade in my fully insured 5* rated kitchen. Each cookie is individually wrapped and posted in protective wrapping and in a mailing box to reach you in perfect condition. Please order in enough time for your celebration. I will endeavour to have the cookies ready to send in a shorter time, but this may not always be possible. I recommend that all our cookies are enjoyed within 3 weeks of dispatch from my kitchen. Fabulous! arrived really quickly and will look amazing on the cupcakes I’ll be making! Thank you! Unicorn and rainbow cake topper was fab! Set off my cake gloriously. I cannot believe it, I've finally opened by box of 41 favours, amazing, I'm so excited about them. Butterflies with a baby blue icing with carefully written names, individually wrapped, and my guests will love them. Well done for providing a super efficient service. Great gift, goyfriend loved them and sooo yummy! Beautiful product, produced to order and very carefully packaged. The birthday girl LOVED it as did lots and lots of Mum's who saw it at the party. Can't thank you enough, you made a caring younger sister of a girl with Autism very happy! Handmade sweet treats - beautiful, delicious and unique.